Out & About Carpets offer a unique “choose at home” carpet and flooring service in Stockport – saving our customers time and money – whilst supplying the finest quality flooring and carpets in the process. We provide a unique service of “Choose At Home” Vinyl, Laminate Flooring & Quality Carpets in Stockport and the surrounding areas. Quality assured carpets in Stockport – with samples brought to your home. All of our carpets are are sourced from the leading brands – giving you high quality carpet without the overheads of other carpet shops in Stockport. Our quality vinyl flooring in Stockport is ideal for most rooms in the house. Easy to maintain and with lots of styles to choose from, vinyl flooring is a popular option for clients with young children and pets. Looking for laminate flooring in Stockport? Our flooring is a popular option for those who are looking for a stylish aesthetic for their flooring – and are easy to clean. With lots of styles, colours and quality to choose from, you can’t go wrong. We have fitted hundreds of carpets in Stockport and surrounding areas. Visit our gallery to see a selection of some of our most recent fits. We have fitted miles of laminate flooring in Stockport homes over the years. Have a look at our gallery to see how fabulous this durable, easy-to-maintain flooring is. Vinyl flooring is one of the most durable, easy to maintain and popular flooring solutions for homes in and around Stockport right now. 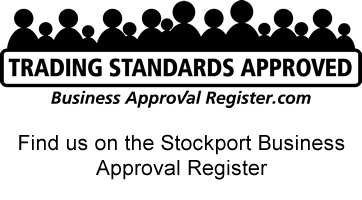 With Out & About you get top quality flooring and carpets, value for money and the reassurance that you’re dealing with a company who’s been uniquely approved by Stockport Trading Standards. We’re a well established company who put customer service as their number one priority. With plenty of reviews online that can tell you more about our service than we ever could, what are you waiting for? Click THE BUTTON TO DISCOVER MORE ABOUT US. Data Protection Data Protection Please tick to confirm you are happy for us to use your email address to contact you in relation to your enquiry. We do not sell your email address on / pass to third parties. Make the best choice of flooring & carpets for your home, from your home. Out & About gives you one of the most extensive range of carpets in Stockport – along with vinyl and laminate flooring – available to choose where it counts – from the comfort of your own home and at your own pace. Afterall there are many decisions to make. Colour schemes? Man-made or wool? Which is harder wearing? What is best for family use? Or for resisting stains? You can rest assured though, that whatever your needs our professional advice will provide answers in your best interests. That doesn’t mean pressure selling. And it doesn’t mean high cost. Our prices are competitive because we don’t have the large overheads of retail shops. We pass the savings other retailers can’t match onto you through unbeatable prices. No gimmicks and never any misleading discounts. Just a personal face-to-face service that means you get to see, touch and feel the product, make sure the colour and style are right, and match your options to your home décor. You can’t do that in showrooms and you certainly can’t do it using the internet with a computer screen. Very quick from ordering to delivery. David gave great and honest advice and the guys that delivered were organised, polite and quick. Great value for money and would definitely recommend them to family and friends. Our personal guarantee puts decades of experience at your service, right through to the time-served fitters who will leave your home looking everything you dreamed it would be. Out & About has perfect choices and prices from a wide variety of products including 80/20 wool twists, polypropylene carpets and top quality, high density underlays. Thanks once again David for your help and advice on some flooring yesterday, really helpful which is why we always use Out & About Carpets. Dave and the fitters from out and about are absolutely fantastic, from start to finish the customer service was excellent, they were all extremely professional and friendly. 100% recommend them and I will be using them again. David was great, he talked through all the different carpets and underlay and made recommendations on what we wanted. Didn’t try to upsell us, used our existing door plate and grippers and followed up once the carpet was fitted to make sure we were happy. Carpet looks great and we will definitely use again when needed. Fantastic selection of carpets, underlay and vinyl. Very professional and personal service, highly recommend. Looking for carpets in Stockport? Laminate or vinyl flooring? We want to hear from you. Data Protection Data Protection Tick this box to confirm you consent to us storing these details and using them to contact you in relation to this enquiry. We do not sell on your details. We will only pass on details to third parties (e.g.fitters) when relevant to your service with us.